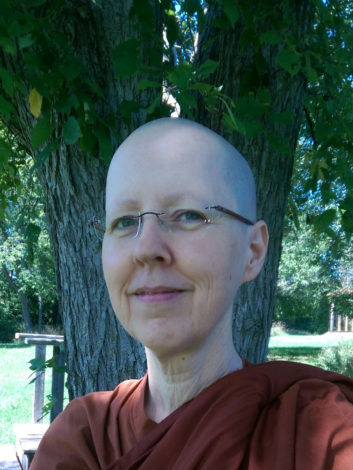 Ayya Nimmala has been deeply inspired by the teachings of Ajahn Chah, and began training as a Theravada Buddhist nun in 2008, at Sati Saraniya Hermitage, with Ayya Medhanandi as her teacher. She received higher ordination as a bhikkhuni in 2011. In 2015, she co-edited the third edition of the Bhikkhuni Patimokkha, a Pali-English vinaya booklet, with Ayya Tathaaloka.